The I Love You Beads Warehouse is located in Sydney’s CBD at 311 Parramatta Rd, Leichhardt NSW 2040. We are the only Swarovski Authorized Wholesaler in the region of Australia & New Zealand. Every year, over 1000 people across Australia and New Zealand become new members at I Love You to access the quality, low-cost beads and findings we provided (Yes, our warehouse is MEMBER ONLY). We are proud to be the suppliers of so many artists and designers and honoured to be a part of all your creative endeavours. Our warehouse covers over 500 square metres and we supply over 5000 different beads and findings to allow you to produce almost any design you imagine. A car park is located at the back of the warehouse to allow for easy access. We offer an extensive range of beads, including Shell Pearl, Paua, Fresh-water Pearl, Chinese Crystal, Coral, Howlite, Glass Pearls and Semi-precious Stone beads. To complete your projects, a huge variety of findings (jewellery components) are available, including diamonty rondelles, clasps, earring hooks, bails, spacer beads, jump rings and pins. We also supply genuine Swarovski, 925 Sterling Silver and Beadalon Wires (USA). Along with the items we offer at competitive prices, our refund and exchange policy will guarantee customer satisfaction. If it was a purchase made at our Leichhardt store, present your receipt within 7 days and we guarantee a full refund. For an exchange of items, present your receipt within 21 days. Customer satisfaction is also extremely important at our online store. If an online purchase is made, items can be refunded within 7 days or be exchanged within 21 days of receiving your parcel through post. It is important to note that only the price of your items will be refunded, the cost of postage is non-refundable. If you require an exchange, you will need to pay for postage to and from our Leichhardt store. We believe that good things should not cost anything extra. It should not be necessary to spend a fortune to create and enjoy amazing things. 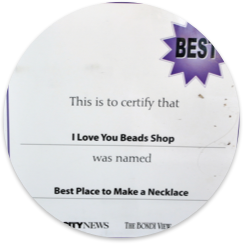 At our I Love You Beads Warehouse, we guarantee the provision of the best quality beads and findings at competitive prices. Your satisfaction and your ability to create unique, durable and highly beautiful items is our goal at I Love You. Australian Beading Vol.7 No2 First Place in "Websites We Love"